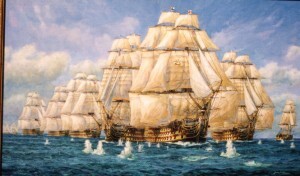 This “Trafalgar Collection” results from a period now unique in the artist’s life when as official artist he had unrestricted access to HMS Victory, the National Maritime Museum (Greenwich London), the Royal Navy Museum, and a letter of introduction from HMS Victory’s Captain that opened many other doors,including many archives and two naval dockyards in France and Spain. There was a combination of my being commissioned (1994 to 1998) as official artist to HMS Victory in preparation for ‘Victory 2005’ the bi centenary of the battle of Trafalgar and a letter of introduction from the then captain of HMS Victory, Lt. Cmdr. Mike Cheshire opened many doors and archives in Britain, France and Spain normally closed even to diligent researchers. At that time Gordon had unrestricted access to HMS Victory, Portsmouth Historic Dockyard, the full co operation of the Keeper and Curator of HMS Victory, Peter Goodwin, was a member of the Society of Nautical Research and the 1805 Club. HMS Victory is iconic; the only surviving example of a type of warship, not a ‘battleship’, more correctly called a ‘ship of the line’ (of battle) that was at one time the pride of the fleets of great nations, the First Rate Ship of the Line of Battle. HMS Victory is valuable, vulnerable, an equivalent would be one castle had survived to our time. Visit here if you can, it will be one of the ‘bonne heure‘ of your life. By happy chance Victory was also one of the finest and most distinguished First Rates ever built. Horatio Nelson was an idealistic, innovative and personally very brave man. He lead an heroic life so is considered Britain’s foremost naval hero eclipsing great seamen like Francis Drake, Hawkins, George Anson and James Cook. Nelson’s efforts certainly helped change world history. Peter Goodwin’s brief was to restore HMS Victory to her ‘Trafalgar Condition’ in readiness for the 2005 bi centenary of Trafalgar. The two men formed a close, mutually advantageous working relationship that persists to this day, to the benefit of this very historic ship, the only surviving example of her type, a 3 gun deck first rate ‘Man of War’ ship carrying over 100 heavy cannons and a crew of some 850 souls. Today you can judge the results for yourself in part through this collection of marine paintings, the accompanying sketches, texts and notes many of which appear on this web site and by visiting HMS Victory at Portsmouth where on most days she is open to the public. While producing this Trafalgar Collection Gordon Frickers visited by appointment among other places The Tate Gallery, Maritime Museum and office of Sea Breezes magazine, Liverpool, The Naval Reference Library Plymouth, Devonport, Portsmouth and San Sebastian naval bases, The National Maritime Museum, Greenwich, London, the Royal Naval Museum Portsmouth, Brest Maritime Museum, the National Maritime Museums of France (Paris) and Spain (Madrid) and with French colleagues, Cadiz (University) and out of curiosity, Cape Trafalgar. Together with Peter Goodwin many remarkable discoveries were made some of which are illustrated in this collection. The popular description of many events were found to be less than accurate, an example being the approach of the British fleet (see “Trafalgar Dawn the French Perspective“, “Nelson’s Column” and “First Shots“) on that fateful Monday morning, 21 October 1805. We learnt a great deal about the accuracy and often inaccuracy of many of the paintings from that period including those made by some very renowned artists. The very renowned Mr. J M W Turner spent several weeks aboard Victory upon her return to England so produced some invaluable insights. There were other artists too who produced beautiful, memorable, valuable paintings and sketches that are also records. We discovered much that was previously little or unknown about HMS Victory and the lives of Nelson, his officers and men; ‘legends’ too like the story in Cadiz where it is claimed Nelson went ashore ‘often’, he had a ‘girlfriend’. In that context the painting “Nelson at Gibraltar” is a fine example of a significant moment missing from most history’s of Nelson. 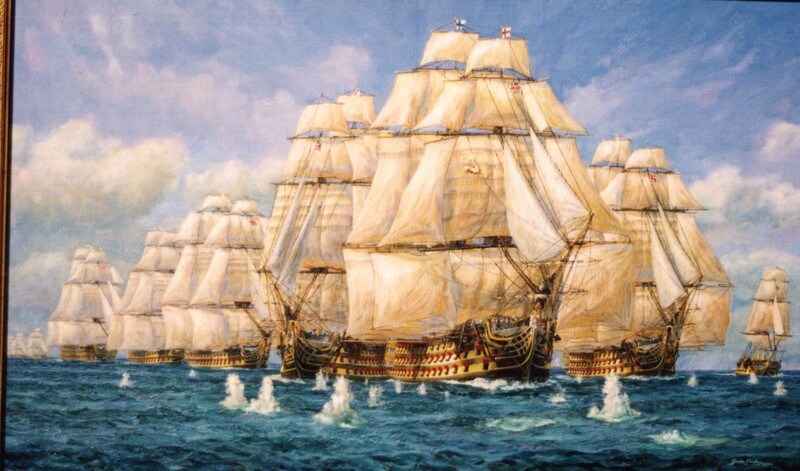 We were able to contribute significantly to HMS Victory’s renovation by discovering, again I say, “among other things”, the true colour schemes inboard (dispelling the myth all below decks was painted red to disguise and lessen the shock of the blood spatter of battle, and out at that period emerged the painting “Nelson’s Bright Yellow” which proved the true yellow used by Nelson who wrote “it makes my ship more war like“. and where Nelson really died on Victory’s orlop deck; discoveries that lead directly to changes Peter Goodwin was able to prove, initiate and oversee; you can see them today when you visit HMS Victory. The good will and good humour of many people in Britain, France and Spain contributed to this amazing Trafalgar Collection. A very big THANK YOU one and all; without you these interesting paintings which are also historical documents as correct as we can make them, detailed even down to which way ropes were twisted, fashions in clothing and how men wore their hair, would not exist. These unrepeatable paintings are part of our combined legacy. Gordon said “In particular I would like to thank Mr. Peter Goodwin, Michele Huve & the Brest Jumlarge, Lt Cmdr Mike Cheshire (Captain, HMS Victory) , the directors of Victory 2005 Ltd and my former wife, Trish Frickers“.